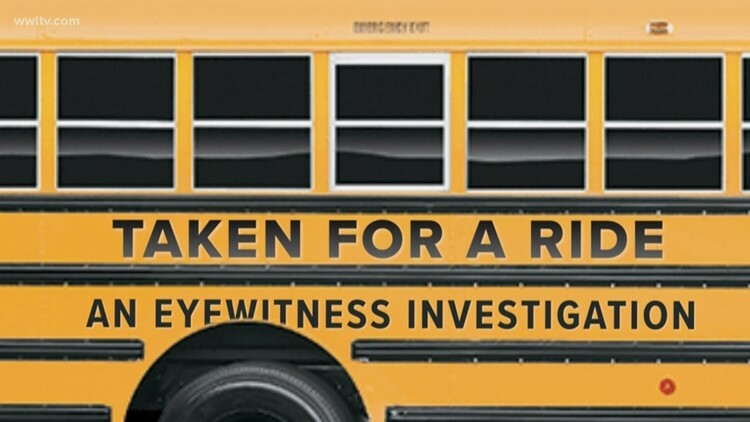 NEW ORLEANS — This is part two of David Hammer's two-part investigative series called Taken for A Ride: An Eyewitness News Investigation. Click here to read part one. Later that month, when a woman called New Orleans City Hall to say she was a school bus driver and didn’t feel safe, the State Police inspected eight of the company’s buses, finding broken emergency exits, inoperable brake lights and turn signals and a driver with a suspended license. Next week, the New Orleans City Council is expected to debate stepping into the regulatory void created after Hurricane Katrina, when charter schools began replacing the city's traditional public schools and centralized school board functions like providing citywide school bus transportation went by the wayside. Now, with the local school boards and the state Board of Elementary and Secondary Education offering no direct oversight over charter schools’ bus contracts, charters are essentially on their own to provide free transportation for tens of thousands of children. Critics say that has created an ad-hoc bus system comprised of private vendors that have skimped on safety to save cash. The city inspections in August inspired Mayor LaToya Cantrell’s administration to propose a new city ordinance to have the Taxicab Bureau register and regulate private school bus companies and their drivers. The ordinance passed the City Council’s Transportation Committee this week and goes to the whole council next Thursday. Charter schools and the Orleans Parish School Board also agreed to take extra steps to improve lax oversight. The school board promised to step up enforcement of state school bus codes and to provide charter schools with training for managing their transportation vendors. The schools promised to provide the school board and the public with contacts and other information about their school bus vendors. How safe are charter school buses? WWL-TV has been investigating these and other problems with charter school buses in a series of reports titled “Taken for a Ride.” Public records the station collected from 90 New Orleans area charter schools showed the independent charter school operators generally lack control over their school bus vendors, leading to major safety violations and disturbing incidents. For example, the school bus that went missing Nov. 2 was carrying students from Athlos Academy of Jefferson Parish on the West Bank to stops near their homes on the East Bank. The route normally took more than 2 hours, but that evening, a substitute driver who was unfamiliar with the route got lost and the bus was found after 4 hours, with six children still on board. The bus was operated by Athlos’ bus contractor, Durham School Services, a major national company. It charged the school among the most expensive rates, upwards of $350 per bus per day, but offered newer buses than most of the local providers and conveniences like a GPS bus-tracking app. But frantic parents and school officials said the app wasn’t working the evening of Nov. 2. One mother, Cheryl Earl, had lost a child in a drowning accident years before and her daughter Ce’Vanne -- so named because she was born seven years after the first child died -- was on the missing bus. 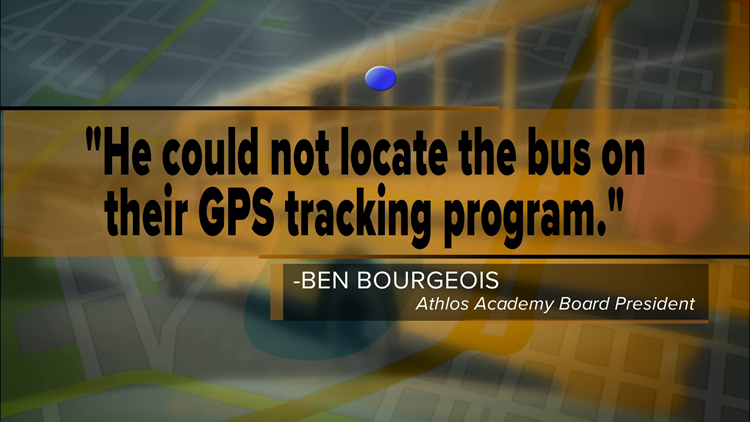 Earl and the Athlos Academy school board president, Ben Bourgeois, both said Durham’s dispatcher told them that night the GPS tracker on the bus wasn’t working and neither was the bus driver’s radio. But Durham spokesman Ed Flavin disputed that later to WWL-TV. The driver was not arrested, police said, and Durham stood by him by retaining him as a substitute driver. But Athlos fired Durham after the incident and replaced it with a small, local company called Kids 1st Transportation. Public records gathered by WWL-TV show Kids 1st has had its own issues. In November, a woman claiming to be a Kids 1st school bus driver called City Hall’s 3-1-1 helpline anonymously to say she didn't feel safe driving the company's buses, according to a city email. Two weeks later, the Louisiana State Police performed a surprise inspection on eight of Kids 1st's 40 buses. The inspectors found 67 violations on those eight buses, ranging from no license plates and no insurance, to the driver who was operating a school bus on a suspended license. 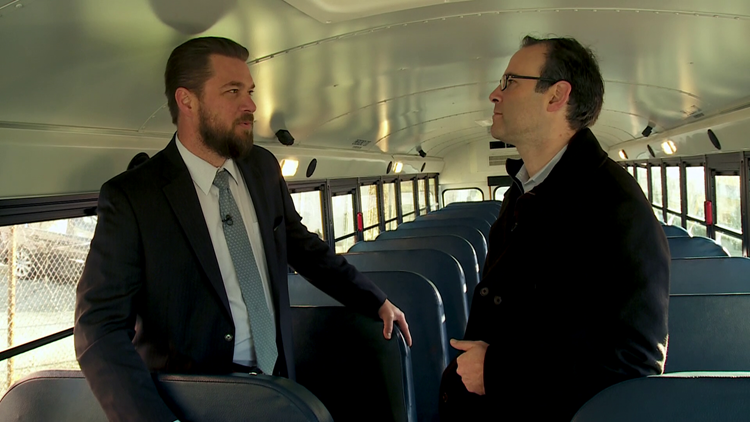 Kids 1st owner Rory Askin said he had just bought the buses that the State Police inspected, and they were used, so that’s why they didn’t have license plates yet and were not up to code. He said now he's made sure all the violations have been fixed. But that was not an isolated incident. 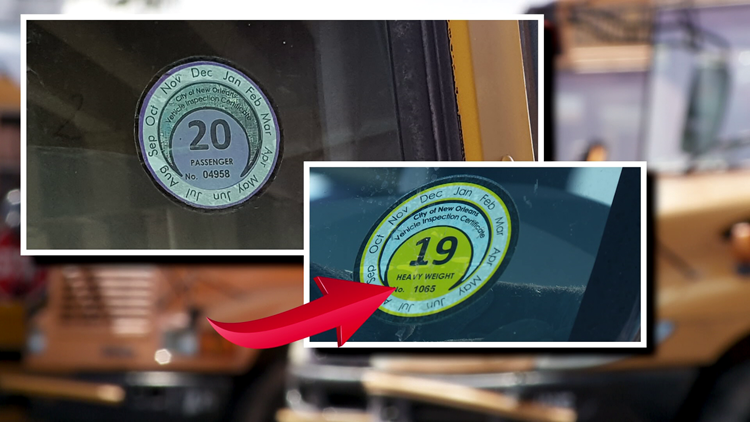 A city sweep of school buses last August found a “Passenger” brake tag, intended for a personal vehicle, stuck on a Kids 1st bus, instead of a “Heavy Weight” vehicle inspection permit, which is what’s required for school buses. Askin said he takes his buses to a special brake tag station designated for commercial vehicles and thought a passenger brake tag was sufficient. A city sweep of illegally parked school buses in August identified a slew of violations by several local bus companies, not just Kids 1st. After hearing about the violations – which included padlocked emergency exits on school buses while they were transporting children, according to city officials – City Councilwoman Kristin Gisleson Palmer said the weak oversight is becoming a real danger. “They're not only endangering the lives of the children and the passengers, but also other vehicles, other drivers,” she said. Interviews with school leaders, bus companies and others suggest that most charter schools are ill-equipped and too inexperienced to properly manage transportation services. They often find themselves pinched by having to use their usual per-pupil government funding to pay for new and rising busing expenses. After personnel costs, which typically run about 70 percent of a school’s budget, transportation is the next highest expense, costing schools 8-to-15 percent of their total budget, according to several school leaders who shared their budgets with WWL-TV. “The dollars that are spent on these school buses is coming directly out of the classroom,” Palmer said. Eleven of the 52 charter management organizations that run the 90 charter schools across the New Orleans metro area – mostly in Orleans Parish, but also in Jefferson, Lafourche, Plaquemines, Tangipahoa and Washington parishes – have Type 2 charters, which are authorized by the state of Louisiana, not the local school districts. Those schools didn't even have to offer transportation to their students until this year, and many of them are being blindsided by insurance problems and mounting expenses. Algiers Charter Schools Association, by contrast, runs seven schools under the Orleans Parish School Board and started offering bus service to students in 2005. Interim CEO Stuart Gay says he and his management team have learned to manage transportation better over the years through trial and error. After dealing with private school bus providers for 13 years, Algiers Charter School Association went a different direction this school year. Gay said they decided to operate their own fleet of brand new 2019 buses, outfitted with the latest safety features. They only hire a vendor to provide drivers now. Adding to those expenses are insurance costs passed on by the bus providers. WWL-TV found the 18 local providers serving area charter schools are struggling with skyrocketing insurance rates, and some have cut corners and created new safety concerns because of it. Mark Hammond runs one of the more established local school bus companies, Hammond's Transportation. It serves more charters schools in the area – 18 – than any other bus vendor. He says all local bus providers are paying a lot more for insurance than they used to. He said his insurance costs have risen at least 60 percent since Hurricane Katrina, and he blames personal injury lawyers and Louisiana’s litigious culture. Parker Stough, a Lafayette-based insurance agent who specializes in the school bus niche, agrees that frivolous lawsuits are driving insurance companies out of the school bus market in Louisiana. He said only two major insurers are writing school bus policies in Louisiana. 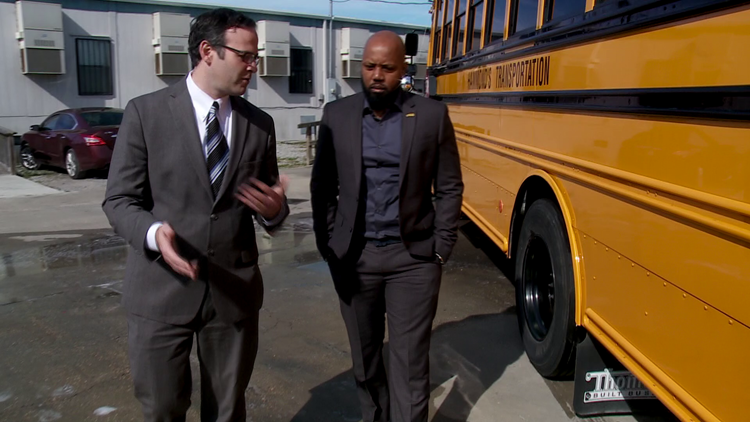 “They're charging whatever they need or want and that's typically $20,000-$30,000 a bus, especially in New Orleans,” Stough said. Those costs are passed on to the charter schools. Derrick Heyl, operations director for New Orleans Military and Maritime Academy, a charter school in Federal City, complained about the insurance costs at a recent City Council meeting. Schools and bus companies, in turn, want to find ways to save -- ways that can increase risk. Some bus companies do that by scrimping on bus maintenance and safety compliance. Others have done it by illegally parking buses around town, rather than leasing a central yard and driving the buses there when they’re not in use. And schools, which are paying $250-$400 per bus per day for their normal routes, are cutting corners by sending buses on longer routes with more kids packed in. “Right now, we're fighting to keep our business so we have to do what makes our clients happy, (even) if that's putting 50 kids on a bus and running 2-hour routes instead of saying, 'No, we can't put more than 40 kids on a bus and it's an hour route,’” Hammond said. Stough says something's got to give. “At what point in time does this problem correct itself? Is it whenever there are no school buses? Is it whenever the kids can't get to school?” he said. School and community leaders say charter schools need to take a more active role in managing their bus service, and that could lower costs. “You've got to read the fine print and not just hand it off to a vendor and hope it goes well,” Gay said. 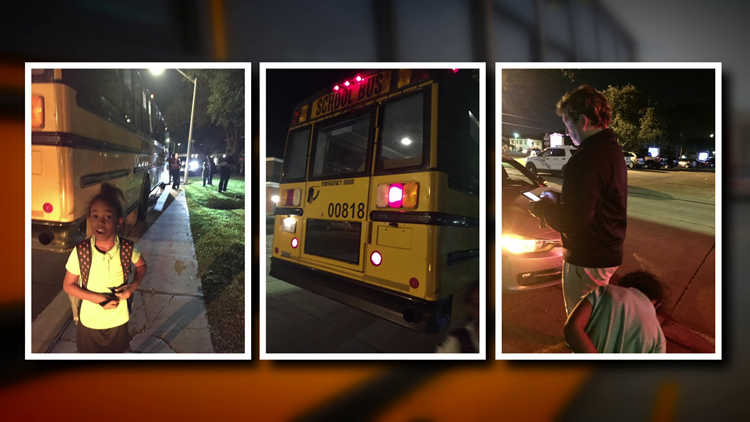 You can use this searchable database compiled by WWL-TV to see which schools hire private school bus contractors and if they turned over proof of insurance, the names of their bus drivers, bus route information and background checks for those drivers. Can't see the search tool? Click here.